Start doing the Spicy bean spread at home: Put the drained and rinsed beans in a bowl. Mash them with a form until you get a thick bean spread. Chop the fresh cilantro and add to the spread. Also add a bit of olive oil so the spread isn’t too thick, chili powder (we used approx 1 teaspoon), salt and juice from half a lime. Now mix all the ingredients by using a fork. Voila Taste the spread and see if you need to add more acidity from the lime, more spice fro the chili och just some more salt! 1. Put your patties on a grill and let it grill for approximately 5 minutes per side. Grill until they have a crispy surface all around them. If you want you can also put the buns on the grill for some seconds so they become warm and tasty. 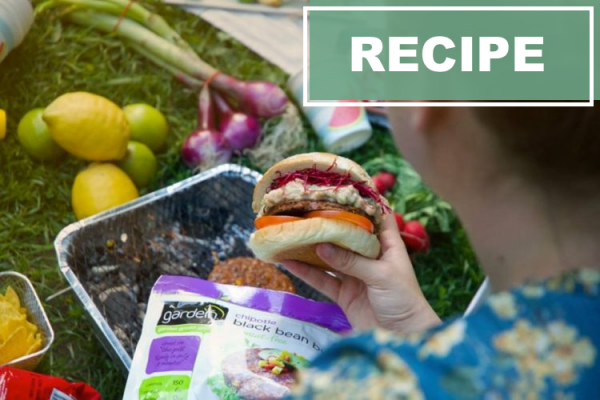 Curious for more vegan BBQ tips? Check out this article! Or do you want to see more burger-style recipes? We have some for you here, here and here. Which ones are your favourites?